Blooms Garden Shop is our absolute favorite florist in Downtown Hattiesburg! Nestled in The Bakery Building on Bushman Street right across from our Historic Train Depot, Blooms creates magic through floral pieces. Blooms has been in business since 1994, serving customers with the best and brightest floral arrangements and gifts. Finding a vendor that caters to you in every way is your dream, right? Guess what? Blooms offers a few different things that you just may fit that description. For years, Hattiesburg brides have been visiting this shop for not just their wedding needs, but any and all holidays that can be spruced up with flowers and gifts. Below you will see a handful of images sharing their work, as well as their gorgeous space. Enjoy! Let’s start with flowers though, their namesake has got to mean something right? Right. From annual holidays such as Valentines and Easter, as well as your Wedding Day, Blooms puts their passion to work creating works of art through floral arrangements for everyone that walks through their doors. 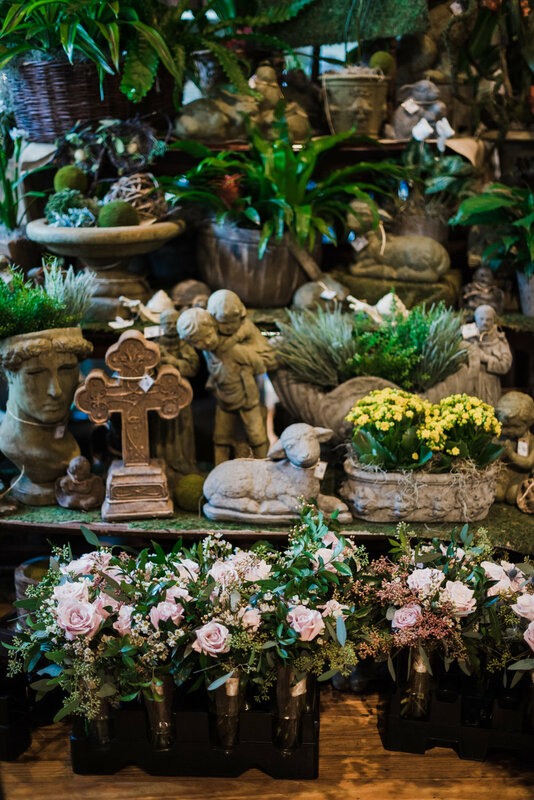 Blooms Garden Shop offers a selection of unique and well thought out wedding gifts. Their pottery for example is a local favorite. From goblets and plates, to gorgeous vases and decorative items, you’re bound to find something that will add a bit of flair to your place. From the staff, to the florals, to the experience of working with Blooms, we cannot express just how much we respect their craft. We suggest you head down to the shop and speak with them yourself. We cannot speak highly enough of them! You can find their website by clicking here.